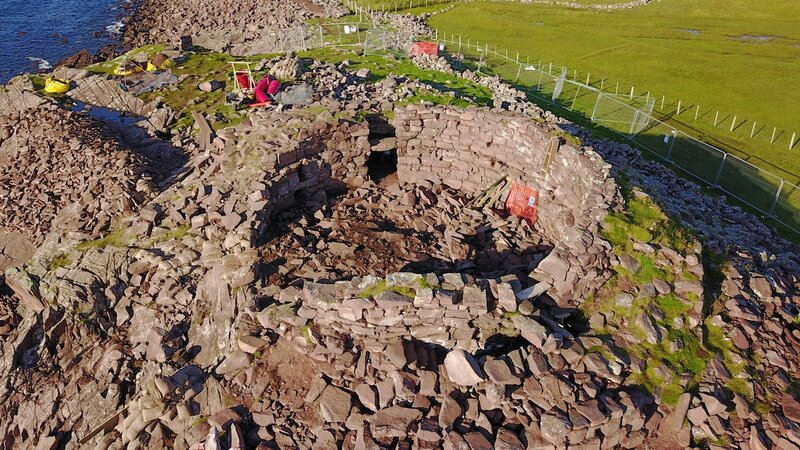 The excavation at Clachtoll broch has been running for just over a month and with each passing day, the excitement seems to be growing. 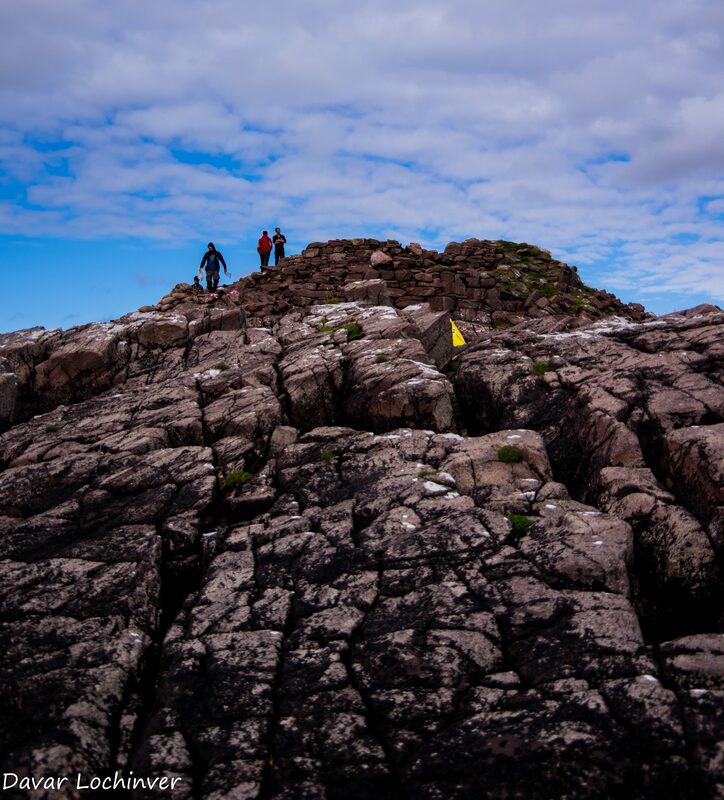 Clachtoll ticks so many boxes in this aging student’s checklist, it’s hard not to ramble on about it. 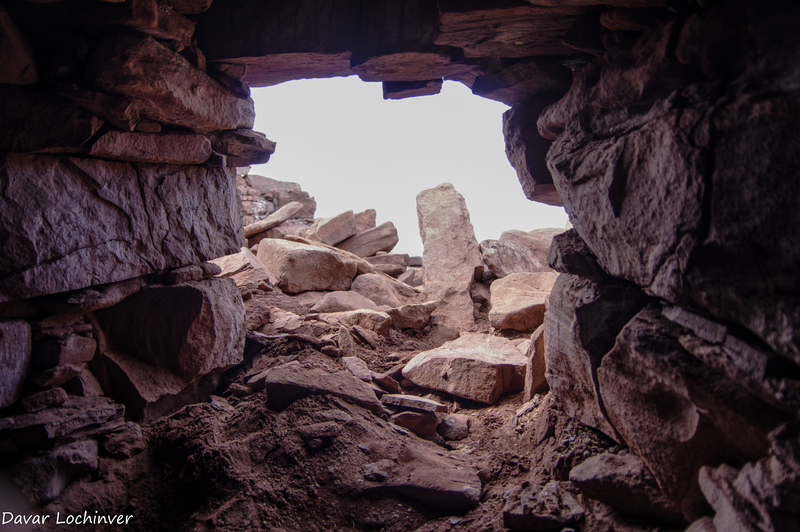 Carbon dating tells us that two thousand years ago, someone piled stones forty odd foot high – current estimates from the amount of rubble put the broch at 12-14 metres. I’m far from a pro and not a great judge of distance, so like to describe that as a little higher than a three-storey house. What were they thinking? 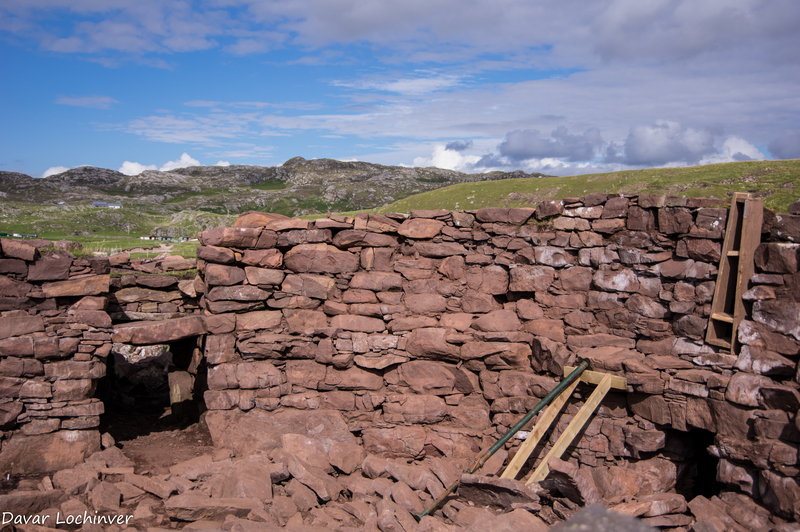 Was Clachtoll a key location on the West coast in the iron age? Why put what is surely the largest broch on the West coast there? Image of 3D Model, created from photos taken 29th July (James McComas). Full model at the foot of the post. The excavation is a community run project. 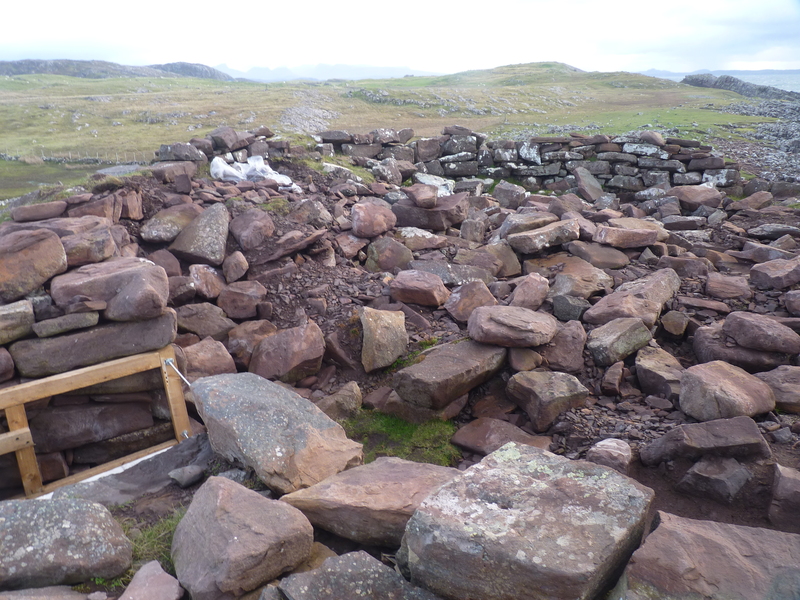 After some frankly amazing fundraising, Historic Assynt have raised enough to get in a team of professionals for not just the dig, but a series of workshops, site tours, a little bit of experimental archaeology – next week, a corbelled cell will be built and potentially some local otters may get a new home as an outcome and most importantly it will result in a legacy attraction (complete with new path created from the spoil heap) for future visitors. Then there’s the manner of the collapse. Most broch’s fell out of use gradually. For one reason or another, their occupants abandoned them, died out or may even have been removed. Many have suffered a gradual collapse over the years – in some cases tens of centuries after their initial construction. The belief is, that Clachtoll is different. 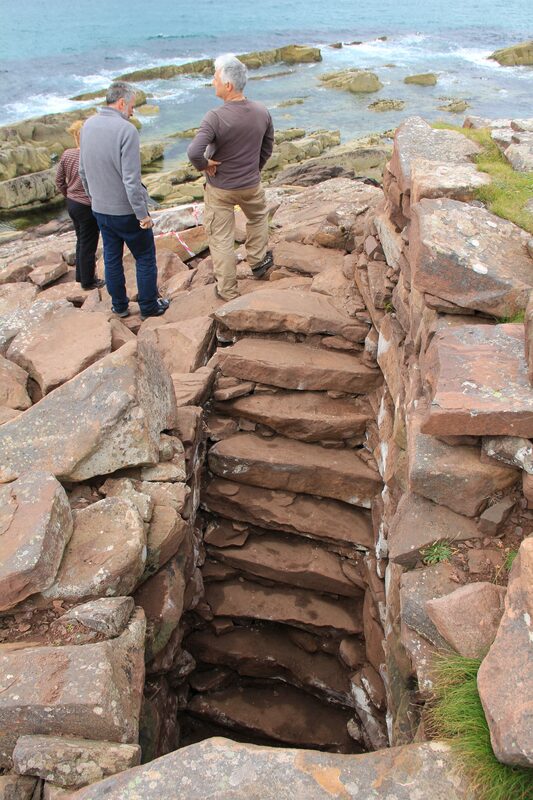 Like many others it collapsed, but in Clachtoll it might have been catastrophic, contemporary, and conclusive enough to prevent re-entry or re-use. This is significant because in most cases, the occupants may well have left with their heirloom artefacts and taken out the family silver. In Clachtoll, we aren’t yet sure if the family got out, much less the silver. When I was a lad in school, I was always told that broch’s were forts. That theory fell out of favour when not a single axe or sword was recovered from any of them. With a catastrophic collapse though? Perhaps Clachtoll will change the game again? What lies beneath? We should have more of an idea by the end of September, but we are already building a picture. The West wall collapsed inwards somewhere between 150BCE and 50CE. We know that from some carbon dating on burnt residue taken on the scarcement (in my simplistic way of thinking – the ledge on which the ground floor ceiling sat) near the doorway on an initial probe in 2010. I should note that John Barber – AOC’s man in the know on broch’s – believes that there may have been multiple minor collapses, repairs and rebuilds prior to the catastrophic event 2000 years ago and possibly a short term temporary rebuild on top of collapse. In 2017, we found similar charcoal all around the scarcement and we are finding increasing quantities as we go down. This tells us there was a fire – a big fire. Maybe even big enough to bring down a 40 foot high tower? Charred rush matting that may have been part of the flooring from the mezzanine level (image R Spencer-Jones). 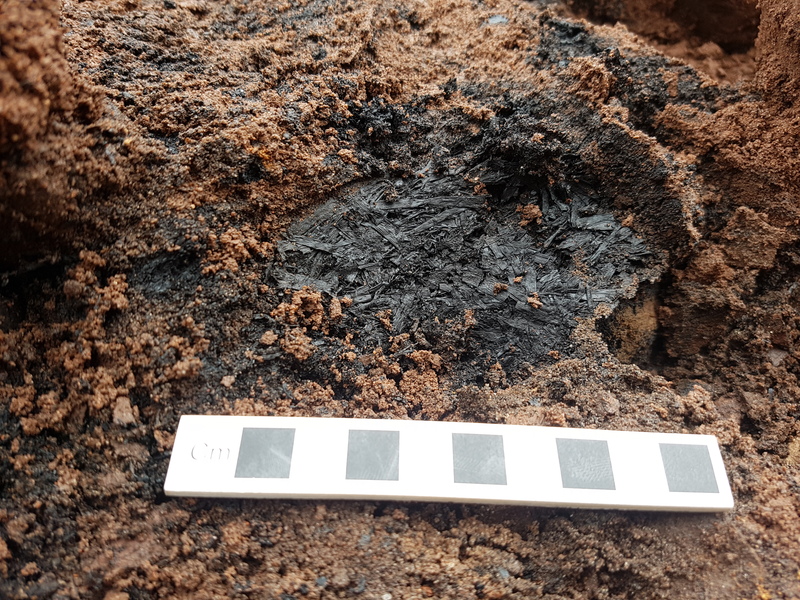 Amongst the finds so far, there is an amazing charred mat less than a metre below the scarcement. Too early of course to say too much, but my imagination has it as a floor covering on the first floor. Who might have trod upon it? Slept on it? Worked on it? Or even created it? 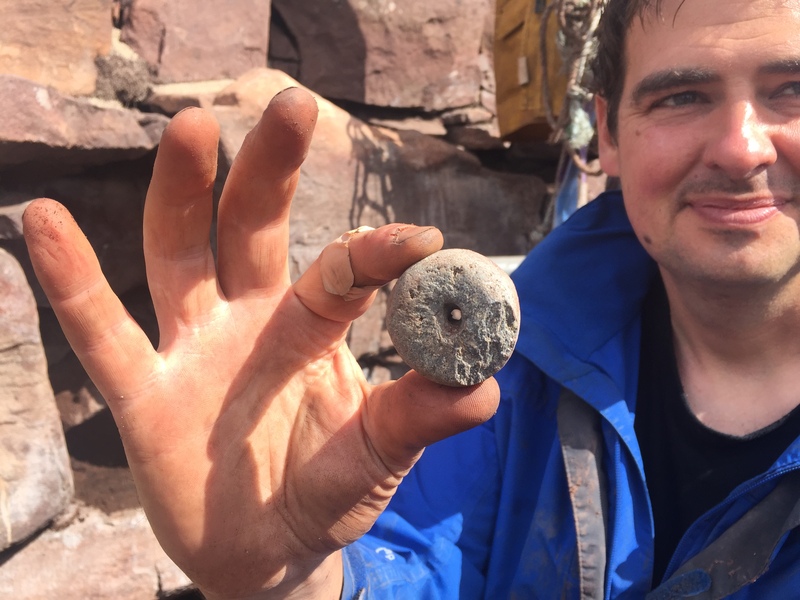 A spindle whorl was amongst the first to be uncovered last month. A common enough object I’m told, but common enough to tell us a little about the occupants. Surely if they were spinning then they had sheep? Or was it goats? or even the ancestors of our Highland cattle? We’re mid-way through this year’s excavation and with the agreement of Historic Environment Scotland the first stage of the stabilisation and conservation of the surviving structure has now started. Progress as of the end of week 4. The interest and the excitement are growing. This, for me, was summed up by NOSAS member Anji Hancock who exclaimed one afternoon “We’re the first people to see that wall in two thousand years!” – That’s a Howard Carter moment. We hope you can come along if you are able, either to volunteer or visit. Who knows what you may find? See Part Two of the blog to find out! Left: peering into a 3 metre high cell between the walls of the broch (AOC Archaeology). More info on this and other features can be read at http://clachtoll.aocarchaeology.com/?p=348. 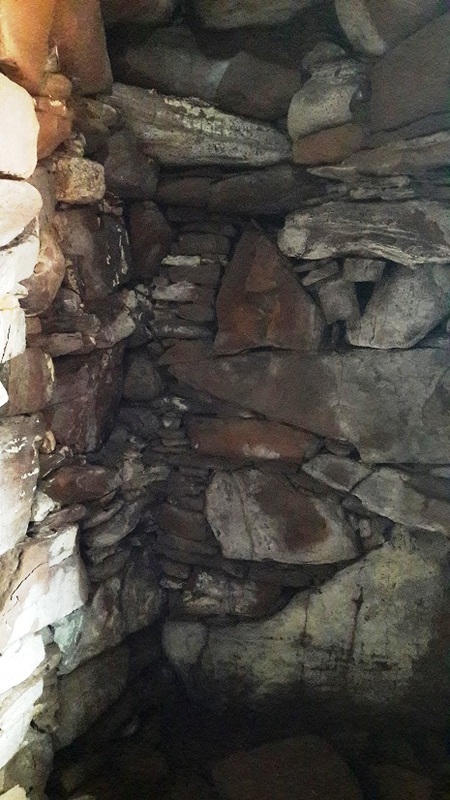 Above: the view from the cell into the interior of the broch. The gradual clearing of cell entrances like these, after being blocked for centuries by collapsed rubble, has been one of the highlights of the excavation so far. 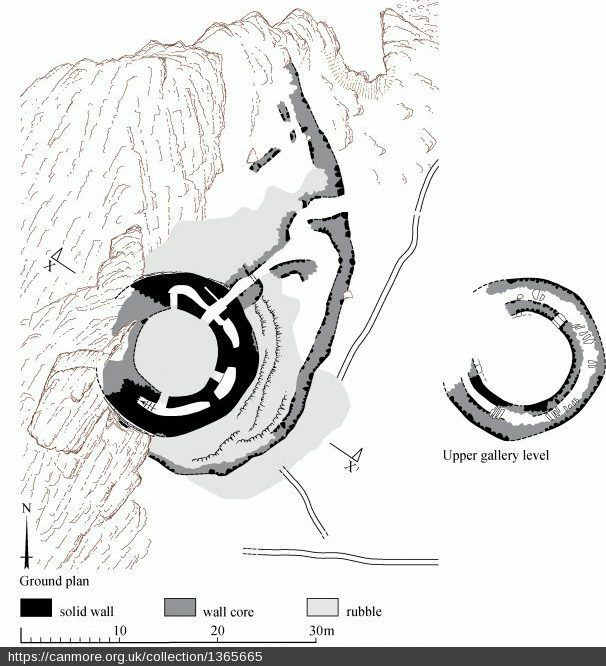 Clachtoll Broch ground plan 2008 (Canmore, ID 4499). 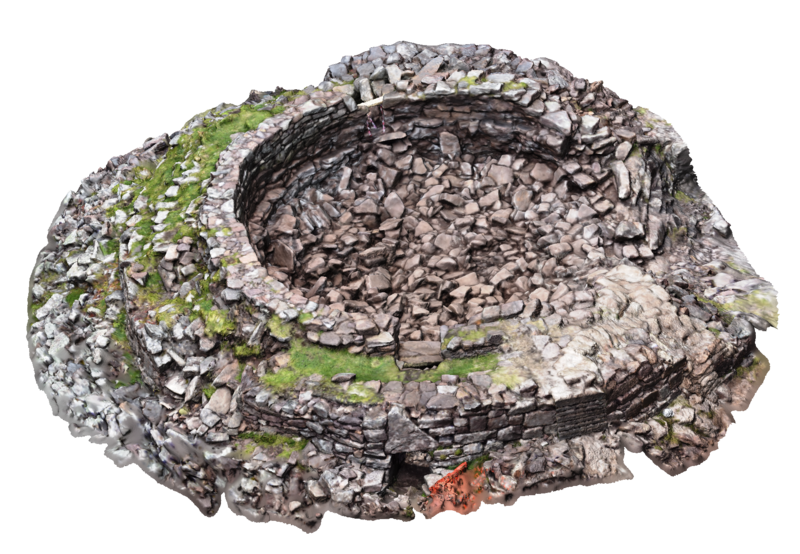 This entry was posted in Excavations, Iron Age, Sutherland and tagged AOC Archaeology, Assynt archaeology, broch, broch 3d model, broch collapse, broch conservation, broch height, broch staircase, clachtoll, guard cell, historic assynt, intramural cell, intramural gallery, iron age archaeology, john barber brochs, radiocarbon dates, rush matting, scarcement ledge, spindle whorl on August 17, 2017 by nosas. I have a theory, why were the Brochs abandoned? When the Romans came to Britain, they circumnavigated the whole coast line and found what they thought at the time were grain siloes. I have been trying to find if there are any records of this taking place as Romans kept records of everything they carried out because money was involved in slavery. The burnt out matting could have been caused by the Roman raids and nothing of value found. How can I find out about Roman records of slavery?